About a year and 4 months ago I accepted the position of Chief Technology Officer at Hyatt Hotels Corporation. It was really a no-brainer decision since I now have the pleasure of working with Alex Zoghlin again. I’ve known Alex for a long time, ever since I joined his first company as a software engineer at Neoglyphics. We have convinced the senior leadership team at Hyatt that technology will be a strategic advantage that will enable us to disrupt the hospitality industry. As software eats the world, all companies in all industries will eventually become technology companies, or they will perish. At Hyatt, for strategic initiatives this means that we are reversing the trend of outsourcing technology and treating it like a cost center. We are hiring a plethora of technologists in many disciplines from product, to dev, to ops, to help us develop platform and application products in a Continuous Delivery model. Check out hyatt.jobs for details. You are a software craftsman who values quality over quantity, but you are not a zealot or perfectionist. You like to laugh in the face of adversity. We have so much interesting work ahead of us, and the best part is that you can actually visit one of our hotel properties and see how your work enhances the experience of our guests and hotel associates. So as they say in infomercials… don’t wait, act now! 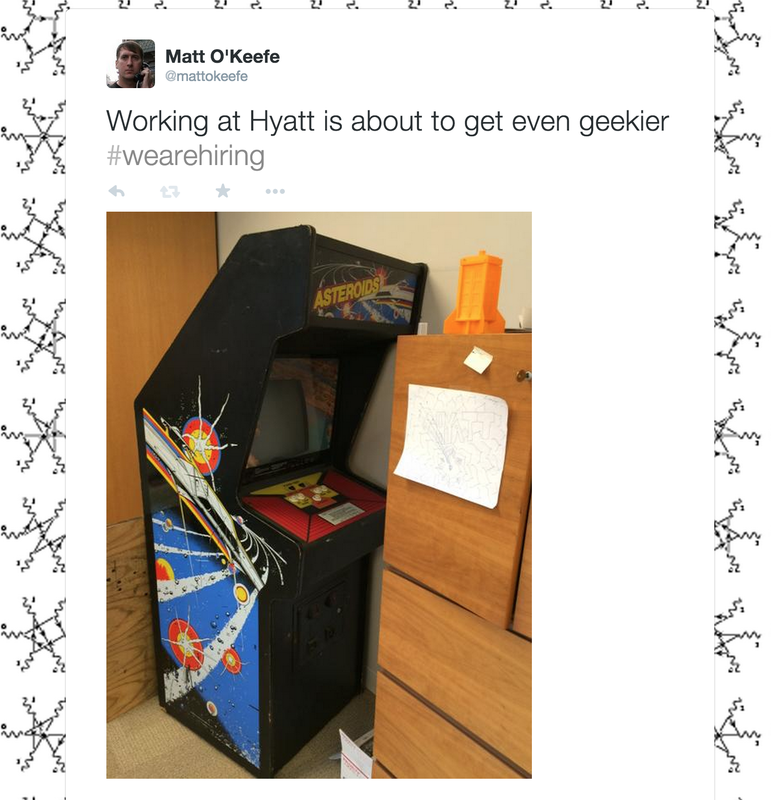 -> hyatt.jobs <- Do it, do it! This entry was posted on February 12, 2015 at 5:43 pm and is filed under Uncategorized. You can follow any responses to this entry through the RSS 2.0 feed. You can leave a response, or trackback from your own site. Interesting post. What’s your team have in mind around accessibility? Do I get to stay at the Park Hyatt Tokyo for free? After one year all employees are eligible for 12 complimentary hotel room nights each year. Not all properties are available for all dates however. I’m staying three nights at the Grand Hyatt Tokyo and another three at the Hyatt Regency Tokyo in November, for free! Great to hear from you Matt ! What about the Hyatt in Sydney,Australia? Hi Roberto- yes, Sydney is on my list! nice..! give me a shout when your are in town! Great post, Matt. It caught my eye and is very similar to a post by my CEO on wired.com around how regardless of your vertical or product, companies are using software as competitive currency. The idea of SDEs- Software Defined Enterprises is echoed in your post. Apprenda takes that concept and delivers an platform to transform the way you approach applications and IT. to improve my website!I assume its good enough to use a few of your ideas! !